Values Voters Tepid, But Romney Presses On In a straw poll at the two-day Values Voter Summit, Texas Congressman Ron Paul was the winner, but much of the talk of the conference was about former Massachusetts Gov. Mitt Romney, who is viewed by many in the movement as soft on social issues. Republican presidential hopeful former Massachusetts Gov. Mitt Romney leaves after addressing the Family Research Council's Values Voter Summit in Washington. In a straw poll for GOP 2012 presidential hopefuls, Texas Congressman Ron Paul was the winner, but much of the talk of the conference was about former Massachusetts Gov. Mitt Romney, who is viewed by many in the movement as soft on social issues. 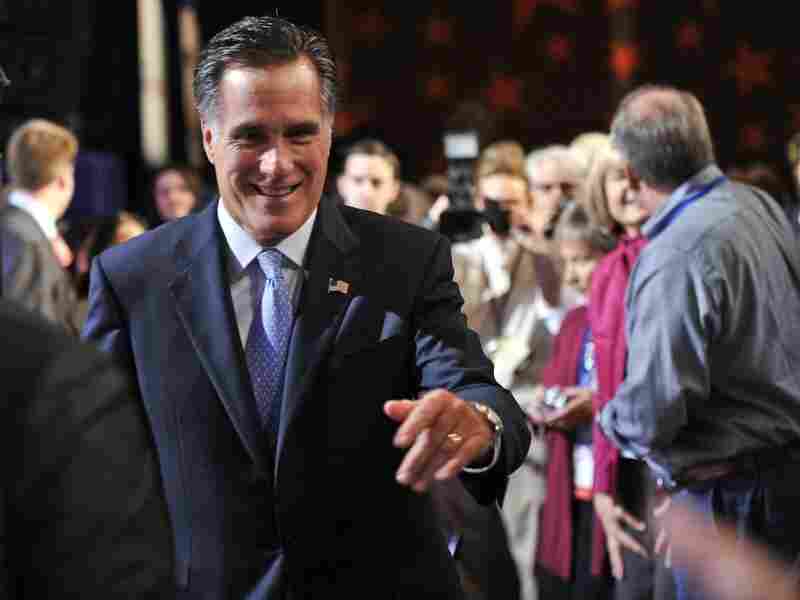 Romney landed in sixth place in the straw poll, garnering just 4 percent of the votes cast. For the former governor, it's a measure of the cool relationship he's always had with social conservatives. They haven't forgotten that he once supported abortion rights even though now he campaigns on a pro-life platform as he did Saturday. "I will nominate judges who know the difference between personal opinion and law," Romney said. "It is long past time for the Supreme Court to return the issue of abortion back to the states by overturning Roe v. Wade." That line was cheered, but overall the reception for Romney was mostly just polite. Romney's Mormon religion was also an issue with some at the summit. On Friday, another speaker, Pastor Robert Jeffress of Dallas, endorsed Rick Perry and called Mormonism a cult and Romney a "non-Christian." Romney did not address that during his speech, but he did criticize another speaker on the schedule. "We should remember that decency and civility are values, too. One of the speakers who will follow me today has crossed that line, I think," he said. Romney was talking about Bryan Fisher of the American Family Association. Fischer – who has a radio show and an Internet presence — often sparks controversy, like in a recent Web video where he singles out Mormonism and says the First Amendment does not apply to non-Christians. Fischer's speech to the conference did not contain such provocative moments, and afterward he took offense at Romney's comment. "I thought it was tasteless and impolite. So I think that shows a lack of respect for the people here," Fischer said. Romney's goal at the Values Voter Summit seemed to be to present himself to the voters at the summit as an acceptable alternative, not in the primaries but in the general election. If he wins the nomination with the help of fiscal conservatives, social conservatives hopefully will be there for him in a general election against President Obama. "I can't say that he energized me, but he's got a lot of experience," said 63-year-old Karen Rose of Asthabula, Ohio. "And so, you know, you have to think about what's going to appeal to a broad part of our country. Anybody is better than Obama." Even a statement like that is a victory of sorts for Romney. Though the conference is dominated by evangelicals, Rep. Ron Paul won with 37 percent of the 1,983 votes cast in the straw poll. He won mostly with help from young people and college students who came just to vote for him. Second place went to Atlanta businessman Herman Cain with 23 percent. Though he finished ahead of Romney's fourth place finish, the other perceived frontrunner, Texas Gov. Rick Perry, continued the slump he's been in for a few weeks by receiving only 8 percent of the vote. The events organizers on Saturday said that Romney and Perry's standing in the straw poll shows they each have a lot of work to do. But for Romney, a single-digit finish may be just fine as long as he's not made any more enemies in the process. A previous Web version of this story incorrectly said that Mitt Romney finished fourth in the Values Voter Summit straw poll. Romney actually finished in sixth place.